Foaming soap equals FUN! Choose from two sizes: 8.5 ounces or 1.67 ounces (perfect for travel) . Our white polypropylene foamer pumps could be a great choice for dispensing a variety of products. These pumps precisely mix liquid and air producing high quality foam with each stroke without the use of gas propellants. 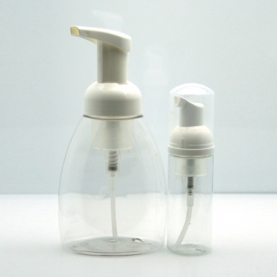 The smaller pump includes a clear plastic overcap. PET stands for polyethylene terephthalate, and is a form of polyester. PET containers are easily identified by the #1 code on or near the bottom. PET is a transparent, lightweight, strong, safe, shatterproof and recyclable packaging material with an inherent barrier suitable for a wide array of product applications. First and foremost, a sustainable package must serve its essential function: to protect the product it contains, delivering it safely with all of its features and benefits intact. Beyond this, sustainable package manufacturers look to reduce the environmental footprint of their package wherever possible through renewable or reduced energy use; reduction of the necessary raw materials and other resources; use of design-for-recycling principles; incorporation of recycled content back into the package; and sound, accessible end-of-life options for that package, such as recycling.